One of our favorite parks is the Tot Lot. I feel like this is a lesser known park, over in Fircrest. I almost hesitate to share it because I don't want it to get crowded. But I'm here for you, friends, and so I shall share this park. We live in North Tacoma, so it takes us about 10 minutes to get to the Tot Lot. It's nestled away in the Fircrest community. It can be hard to find, so I included a map below for reference. Fence - This is by far the number one feature at this park. If you have a toddler like mine, they like to run free and can be little escape artists. I get nervous being at parks near busy streets for this reason. But here I can worry less because there is a fence surrounding the entire play area. No escaping! Swings - They have a variety of swings here. There is the baby swing, the standard swing, and then there is even a tire swing. Sandbox - There is a pretty sizable sandbox at the playground. There are little shoves and dump truck toys for endless digging, scooping, and piling into toys. We always spend some time here in the sandbox. Toys - The first time we went to this park, there were lots of bikes, scooters, and push toys. They have diminished a bit, but there are still plenty of toys. The last time we went, there was a fun push toy as well as a Little Tikes car that Caleb enjoyed. I haven't seen many other parks that have cars and toys that just stay there for the community. They are a bit dusty, but the kids don't care and they are so dirty that I care either. Slides - I counted five slides when were at this park last week. Four of them were on the playground equipment - one tunnel slide, one curvy slide, two standard slides. The fifth slide is a stand-alone type slide that can be moved around. I think that's enough slides for everyone. Taxi & Bouncy Horse - These are those playground fixtures that have the coil underneath that make them bounce. I'm sure they have a name, but I don't know it. 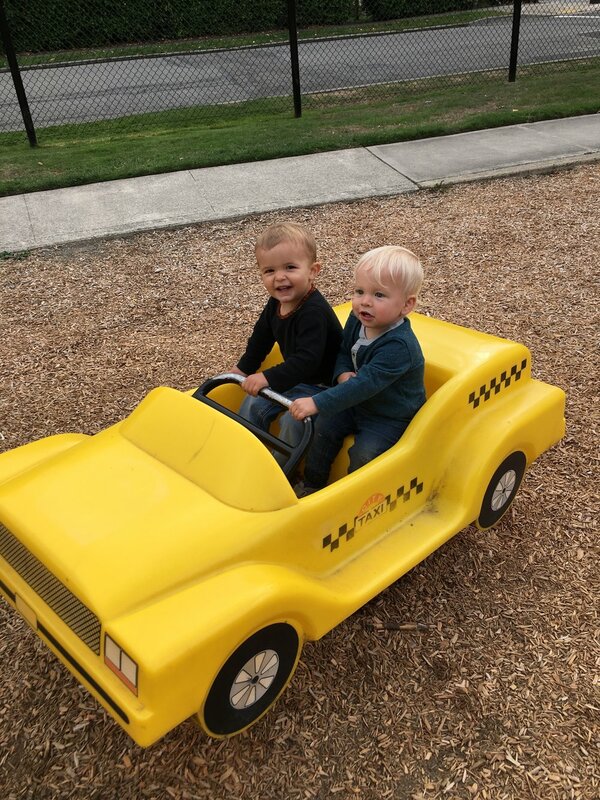 Anyway, the taxi car one is always a hit, and when we go with friends, they usually love to sit next to each other and laugh. Teeter-Totter - I wrote that and thought, teeter-totter is a funny name. Ha! They have a movable teeter totter there, but also a funky one that is for a bit bigger kid. It has four seats and the opposite seat goes up and down. You'll have to look at the picture as this is definitely tough to describe. Balance Beam - I figured I should mention this since Caleb and his friend did, in fact, play on this when we were there last week. Although, they don't walk on it, but scooch across it together. Hilarious really. Playground Fixtures - There are two playground type fixtures (maybe you call them jungle gyms?). They are newer and have great climbing options. One has a frog that you can climb, and the other a bridge to cross. There are also rock climbing walls for slightly bigger tots. Oh, and I also appreciate that there aren't too many drop-offs. You know what I'm talking about, those areas that have no fence and just expect your kid not to jump/fall out. Those make me nervous. Tables & Benches - There are a few tables and benches all around the play area. Super convenient if you just want to sit and watch the kids, or have a snack break! Bathrooms - I've noticed quite a few playgrounds that don't have bathrooms, or if they do, they are porta-potties (yuck!). Having the bathroom is very handy, and I know will be appreciated when we hit potty training days. I didn't use it (sorry), so I can't account to its cleanness, but at least they have them. Fred Flintstone - Ha! Yes, there is a statue of Fred, for some reason. Parking - It's street parking, but I've never had an issue getting a spot. Sunshine - There isn't any shade over the playground itself, but there are trees on the sides to get some shade in the summer. This park can get hot on those hot hot summer days, but we're in the PNW, so that's not the majority of the year. Usually, I like parks that have more sunshine. I like this one since you can get a little bit of both. With the toys and some movable things, you can also find a way to play in the shade, if needed. Age Range - I only have one kid, and he's a two-year-old. I know this park is perfect for him right now. We started going here when he was one-year-old, so I think it's safe to say this park is excellent for toddlers. I'm not sure how an older kid, like eight years and up would enjoy it here. I'm sure they'd like it for a bit, but this may be a better one for tots (hmm, tot lot, maybe that explains it, wink wink). And it's not just me; Yelp Reviewers love this park as well. Four stars!